The Tao of Anarchy: There is no God. There is no State. They are all superstitions that are established by the power-hunger psychopaths to divide, rule, and enslave us. It's only you and me, we are all true and real existence though in one short life. That is, We all are capable to freely interact with one another without coercion from anyone. We all are capable to take self-responsibility to find ways to live with one another in liberty, equality, harmony, and happiness before leaving this world forever. We all were born free and equal among all beings on this planet. We are not imprisoned in and by a place with a political name just because we were born there by chance. We are not chained to a set of indoctrinated beliefs that have been imposed upon us by so-called traditions. This Planet is home to all of us. No one owns it. We share the benefits from and responsibility to this Earth. We pledge no oath, no allegiance to no one; submit to no authority. We are all free and equal. The only obligation we all must undertake constantly with consistency is to respect the same freedoms and rights of others. Không bỏ phiếu cho ÁC QỦY !!! Chỉ có những kẽ sẽ được hưởng lợi từ cuộc bầu cử giữa hai tên Obama và Romney liên kết với bọn đầu xỏ tài phiệt để lèo lái và cai trị đất nước Mỹ mới đi dồn phiếu cho 1 trong 2 tên ÁC QỦY này thôi. Chavez is one of the American right-wing’s favorite bogyman, because Chavez helps the people instead of bleeding them for the rich, which is Washington’s way. While Washington has driven all but the one percent into the ground, Chavez cut poverty in half, doubled university enrollment, and provided health care and old age pensions to millions of Venezuelans for the first time. Little wonder he was elected to a fourth term as president despite the many millions of dollars Washington poured into the election campaign of Chavez’s opponent. While Washington and the EU preach neoliberalism–the supremacy of capital over labor–South American politicians who reject Washington’s way are being elected and reelected in Venezuela, Ecuador, Brazil, Argentina, Uruguay, and Bolivia. It was the Ecuadoran government, not Washington, that had the moral integrity to grant political asylum to WikiLeaks’ Julian Assange. The only time Washington grants asylum is when it can be used to embarrass an opponent. In contrast to the leadership that is emerging in South America as more governments there reject the traditional hegemony of Washington, the US political elite, whether Republican or Democrat, are aligned with the rich against the American people. The Republican candidate, Mitt Romney, has promised to cut taxes on the rich, taxes which are already rock bottom, to block any regulation of the gangsters in the financial arena, and to privatize Social Security and Medicare. Privatizing Social Security and Medicare means to divert the people’s tax dollars to the profits of private corporations. In Republican hands, privatization means only one thing: to cut the people’s benefits and to use the people’s tax dollars to increase the profits in the private sector. Romney’s policy is just another policy that sacrifices the people to the one percent. 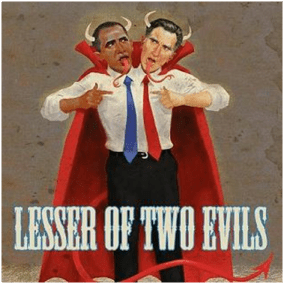 Unfortunately, the Democrats, if a lesser evil, are still an evil. There is no reason to vote for the reelection of a president who codified into law the Bush regime’s destruction of the US Constitution, who went one step further and asserted the power to murder US citizens without due process of law, and who has done nothing to stop the exploitation of the American people by the one percent. If Americans had any sense, no one would vote in the November election. Whoever wins the November election, it will be a defeat for the American people. An Obama or Romney win stands in stark contrast with Chavez’s win. Here is how Lula da Silva, the popular former president of Brazil summed it up: “Chavez’s victory is a victory for all the peoples of Latin America. It is another blow against imperialism.” Washington, making full use of the almighty dollar, was unable to buy the Venezuelan election. How will a Romney or Obama win be summed up? The answer will be in terms of which candidate is best for Israel’s interest; which is best for Wall Street’s interest, which is best for agribusiness; which is most likely to attack Iran; which is most likely to subject economic and war protesters to indefinite detention as domestic extremists. The only people who will benefit from the election of either Romney or Obama are those associated with the private oligarchies that rule America. # # # #Paul Craig Roberts, Boiling Frogs Post contributing author, is a former Assistant Secretary of the US Treasury and former associate editor of the Wall Street Journal. He has been reporting on executive branch and cases of prosecutorial abuse for two decades. He has written or co-written eight books, contributed chapters to numerous books, and has published many articles in journals of scholarship. Mr. Roberts has testified before congressional committees on 30 occasions on issues of economic policy, and has been a critic of both Democratic and Republican administrations. You can visit his website here. Next Next post: Vạch rõ âm mưu đằng sau cái gọi là LHQ-21 PHÁT TRIỂN VỮNG BỀN: độc quyền cai trị của Trật Tự Mới cho Thế Giới.